More than two centuries ago, Carolus Linnaeus (a.k.a. 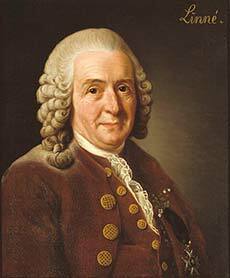 Carl von Linné, Carolus a Linné, Carl Linnaeus, or simply L. systematically) changed our way of understanding the natural world. We still use Linnaeus's (1707–78) taxonomy, albeit with many changes and modernizations. Linnaeus certainly would have approved of Willi Hennig's (1913–76) cladistics, computational biology, and DNA, even when these approaches altered Carolus Linnaeus's original scheme. Linnaeus had a huge impact on the intellectual world those many years ago, influencing not only scientists, but philosophers (Jean-Jacques Rousseau and Johann Goethe, to name just two), artists, poets, and Linnaeus's work provided a new way for humans to understand the natural world; it was invigorating, breathtaking, and revolutionary all at once. Many responded to Linnaeus's vision; some became Linnean apostles, searching the world for new genera and species. Others acted as Linnean evangelists, spreading the news about this new system of looking at life on the planet. Still others acted as defenders and interpreters of Linnaeus, striving to protect and mold his fundamental ideas. We might think of Sir James Edward Smith as a member of this latter group, indeed the holotype of Linnean defenders. James Edward Smith was the eldest of seven children born to a wealthy wool merchant. He studied at home initially and then traveled to the University of Edinburgh to pursue medicine. Medical training at that time involved a detailed knowledge of natural history, especially botany. It was at Edinburgh that James encountered John Hope (1725–86), professor of medicine and botany, and one of the earliest apostles of Linnaeus in Great Britain. Smith was smitten by Linnaeus and especially plants, thanks to Hope's influence. In 1783, James Edward Smith left Edinburgh to further his education in London, armed with introductions from Hope to his scientific colleagues. The most important letter was from Hope to Sir Joseph Banks (1743–1820), then president of the Royal Society, the most important scientific organization in the eighteenth-century world. Banks was at the height of his powers at this point, positively aglow with his discoveries as a member of James Cook's (1728–79) first expedition (1768–71) to the South Pacific on the Endeavour, well connected thanks to his friendship with none other than King George III (1738–1820). We can only guess that Smith and Banks were immediate friends, both fueled by a passion for Linnaeus and natural history, both of independent means, to be diplomatic. Fate interceded to cement their friendship even more. In Sweden, Linnaeus's son died, leaving his wife, Sara, and daughters to deal with a large collection of books, specimens, letters, and related scientific flotsam and jetsam. Sara was ready to sell this collection for 1,000 pounds. This was no small sum in that day; there are various techniques to calculate its equivalent value, roughly 98,700 British pounds (or $149,283) today. Sara first approached Banks, but Banks was not interested for various reasons. He mentioned to Smith that this unique and invaluable archive of their scientific hero was available. Banks probably also noted that there were others interested in the collection, including Catherine the Great (1729–96) in Russia and Oxford professor John Sibthorp (1758–96). Smith arranged for a loan from his father, and in little over a year, in October 1784, the collection arrived in Smith's apartments in Chelsea. Smith realized that he had a great collection in his possession but also understood that this panorama of Linnean materials needed to be accessible to all. Linnaeus was the greatest scientist of his time; his papers, records, and collections demanded accessibility both in Smith's time and in the future. Smith decided a tour on the continent would help him decide the best possible fate for the collection, while giving him experience, connections, and a professional imprimatur. Between June 1786 and autumn 1787, Smith made important contacts, picked up a medical degree at the University of Leiden, and crystallized his notions about all things Linnaeus. Upon his return, he relocated to a new home on Great Marlborough Street in London, and began to formally create a professional fan club for Carolus Linnaeus, entitled the Linnean Society of London. Its first meeting was held on April 8, 1788, and the Society flourishes today, as the world's oldest society dedicated to biology. James Edward Smith became president of the Society for life, re-elected every year until his death. He was prolific, creating books and papers on all matters relating to Linnaeus. The Lenhardt Library of the Chicago Botanic Garden has a number of Smith's publications, since his interests were largely botanic and Linnean, a perfect combination. I find these books and papers to be utterly revealing in helping me to understand that eighteenth-century craze for Linnaeus. There is no phenomenon today to match it; it would be as if Ernst Mayr (1904–2005) or Stephen Jay Gould (1941–2002) were pop stars! Imagine James Watson (1928–) of DNA fame with his own late-night talk show, featuring a regular stream of biologists and evolutionists entertaining a global television audience with stories about Charles Darwin and Gregor Mendel or jokes about Trofim Lysenko and Jean-Baptiste Lamarck ("Have you heard about the short-necked giraffe? Stop me if you have …"). One obscure book by Smith in the Library's collection is entitled Tracts Relating to Natural History, published in London in 1798. It is essentially a collection of essays by Smith on a variety of topics related to Linnaeus and botany, some of which initially appeared as speeches before the members of the Linnean Society. One paper in this anthology that caught my attention appears at first glance to be a seemingly innocuous essay, a book review read at the Society on Tuesday, March 3, 1789. One might think that an analysis of a book might not the most exciting topic to endure, but the review was by Smith of a book he found most offensive, or in his words, "most impudent and ridiculous." It was a book insulting to the good word of Carolus Linnaeus, and James Edward Smith could not let this "curious work" go unnoticed. Smith set his sights on a folio edition of Linnaeus's most important publication, Systema Naturae, published in the Hague in Netherlands in a multilingual edition in 1765 by Frederic Staatman. Systema Naturae appeared in 12 editions in Linnaeus's lifetime, the last (the twelfth) published in three volumes between 1766 and 1768. Staatman had a reputation for publishing all sorts of books, some of which might be considered dangerous, scandalous, or wrong-headed. It is not surprising that Staatman published a collection of what might be considered politely as inappropriate letters to and from Jean-Jacques Rousseau in the same year as this Systema Naturae. Staatman's edition of Systema Naturae clearly was unauthorized, taking advantage of enthusiasm for all things Linnaeus. Frederic hoped that his edition of Systema Naturae in Dutch, English, and French would appeal to those for whom Latin might be a problem. It certainly was aimed at those who were quite unknowledgeable about other editions sanctioned by Carolus Linnaeus. James Edward Smith seems almost apoplectic in its criticism of Staatman and his editorial henchmen. Smith's first salvo seems to find humor in this work's errors; he writes "I have often contemplated the production with equal wonder and contempt, and have amused myself in conjecturing how the ignorant compiler of it could fall into such strange errors as he has done." Smith then complains deftly about the botanical aspects of this work, where, Smith notes, "a young student might be much misled" and "an old one puzzled in no small degree." The most offensive part of this work seems to be its illustrations, where more than half are "erroneously named." Smith remarks that plant identification on the figures must have been "applied by lottery, for it is absolutely impossible that any one in the least acquainted with plants could make such stupid blunders." Smith then itemizes all of these graphic errors, calling them "the ravings of a Maniac, whose origin and connection cannot be traced." This essay reveals that there were charlatans and tricksters about, ready to profit from the Linnean phenomenon in the latter half of the eighteenth century. Frederic Staatman saw profit in Linnaeus and organized a team of hacks to produce a horrific edition of Systema Naturae. James Edward Smith saw it as his duty to point out the travesty of this work, as self-appointed defender of Linnaeus's professional honor. As a result, Staatman's edition of Systema Naturae is exceedingly rare, as perhaps this Linnean oddity deserves. James Edward Smith's essay provides a window into the Linnaeus phenomenon unlike any other work of its time.